A few minutes spent reading these instructions will save you time and produce amazing results. Before getting started you will need to wash the interior surfaces with a mild dishwashing detergent such as Ivory, Joy, or Dawn to remove any oily residue. This should be repeated periodically to ensure the Bowl surfaces are clean and oil free. Never scrub the Bowl with an abrasive, ever! Using a self-contained method is the most efficient and recommended way for processing your prescreened concentrates. First, prescreen your concentrates to at least 30-mesh using a classifier sieve. Screen them into the pail you store your concentrates, with water until you are ready to process them. Keep the concentrates wet with water treated with an emergent such as "Jet Dry" to break the surface tension, and prevent fine Gold from floating over the top of the cone. Jet Dry and similar products are available at most grocery and discount department stores. A 12-V, 750-GPH submersible pump provides an ideal low-pressure water supply for the unit. 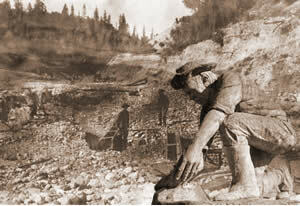 Pre-rigged 12-V pumps are available at Pioneer-Motherlode Mining Supply. Level the Bowl so that the water is even with the top (outer rim) of the Bowl, the Bowl is equipped with adjustable folding legs that extend to level the Bowl on the bucket it rests on during operation. 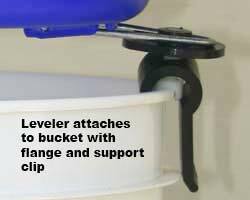 The use of the optional levelers with hold down clips make the Bowl more stable as it rests on the bucket. For optimal results, it is imperative to prescreen the concentrates using a 30-mesh sieve before adding them to the Bowl. Classifying the concentrates using nested sieves (30, 50, 100) will speed up the process considerably. For example, 100-mesh concentrates require more time to process than 50-mesh, etc. Fill the Bowl with treated water; shut off the water supply, then add one cup of concentrates along the outer edge the Bowl (inside). Always close the water supply valve before adding more concentrates. We recommended adding no more than 1 ½ cups at a time. After placing the concentrates in the Bowl, open the water control valve until the water level reaches the top of the outer rim without spilling over the rim. When the water reaches the top outer rim of the Bowl, adjust the flow to prevent it from flowing over into the 18-gallon tub. To recover micro-fines, prescreen the concentrates using a 50, or 100 mesh sieve. After adding the concentrates to Bowl, adjust (increase) the water flow slowly until waste discharges over the center cone. 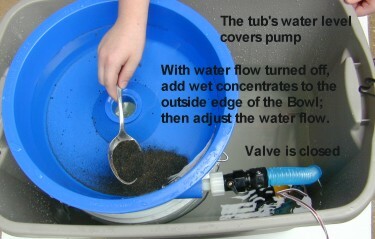 Set the control valve to maintain a constant water level. Note: Maintain the water level 1/4" from the top of the outer rim of the Bowl when using 50 mesh pre-screened material; 1/2" from the outer rim if prescreening using 100 mesh pre-screened material. A good rule of thumb is, the higher the screen mesh number, run lower and slower. This isn't rocket science� If material flows over the edge of the Bowl, or the water flow is too great causing gold to be swept over the inner cone into the retention bucket, don't panic, the gold will remain in the bucket, or tub for that matter. The learning curve is about as steep as the mountains of Florida. If the water flow rate is to great, cut it back; too low, increase the flow. Watch the discharge over the rim of the inner cone; if you see micro Gold being swept over rim, slow it down a little. Place the Bowl over a three-five-gallon plastic pail (10"-11" ID) inside the 18-gallon tub; attach the hose from the pump (water supply) to the Blue Bowl, then level the Bowl. Position the pump inside the tub, beside the pail, about 2" +/- from the bottom (placing the pump in the tub helps avoid getting trash in the pump.) Placing the pump on a common brick works well. Fill the pail with water first; then fill the tub to within two inches of the rim of the bucket; add Jet Dry to the water then start the pump. You can raise or lower the bowl by turning the large disc clockwise or counterclockwise while attached to the bucket. The flange will hold the leveler in place as the disc is moved in either direction. Once the Bowl is level, adjust the water flow so that the water is running at the top of the outer rim of the Bowl, but not over flowing. An even swirl pattern around center cone is desired. Keep the water inside the Bowl; this will allow the vortex to maintain its strength and remove the black sands from your Bowl. Note: If there is a small amount of minus 30 garnets, black sand, or other foreign matter that will not wash out of the Bowl, shut the unit down. When the water flow has stopped and the level has dropped, use a bulb snuffer to blow the material to the outer side of the Bowl then restart the unit. Material trapped by Gold can be able to be swept away by the vortex. Before cleaning out the Bowl, shut off the water supply and allow the water to settle down. The Gold can then be removed with a sniffer bottle. 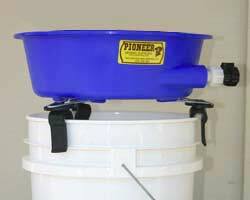 The complete nesting Blue Bowl concentrating system is available at Pioneer-Motherlode Mining Supply and authorized dealers. Prices range from $169.95 a standard kit, to $214.95 for the deluxe outfit. For optional equipment, contact Heather. Customized outfits are available through Pioneer Mining Supply. Panning fine-Gold concentrates by hand is difficult and tedious. The Blue Bowl can recover Gold as fine as talcum powder when setup and operated properly. Every new piece of recovery equipment has a learning curve; the Blue Bowl system is so simple a child can use it effectively, with outstanding results! Just ask Tyler.